COLUMBUS, OHIO — December 2, 2015 — Scriptel® Corporation (Scriptel), a leading provider of electronic signature solutions and capacitive pen digitizing components, today announced the launch of their partner page supporting the integration of Scriptel’s signature pads with GoSign Advanced FileMaker Signature Capture by Geist Interactive. 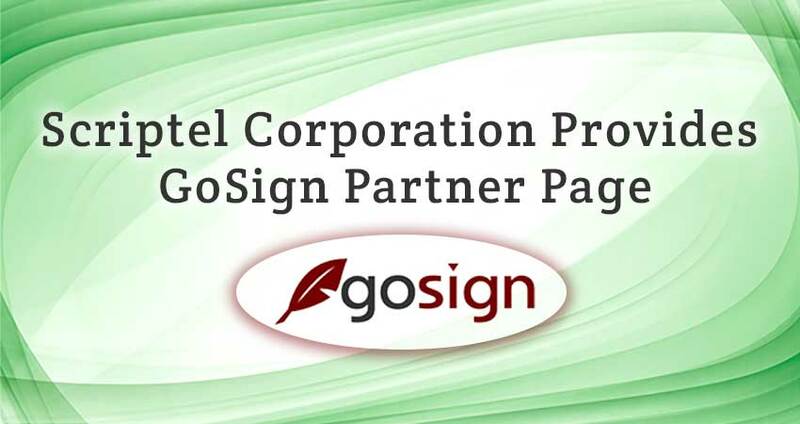 The partner page provides information on the integration’s benefits for GoSign users, supported models and also a video tutorial on the installation and use of Scriptel signature pads. GoSign v3.5 is certified compatible with Scriptel signature pads featuring the EasyScript interface, including the Slimline 1X5 (ST1476), Desktop 1X5 (ST1401), Desktop LCD (ST1501), Compact LCD (ST1551) and Magstripe LCD (ST1526). All Scriptel signature pads are also verified as Citrix® Ready and supported in Terminal Services and other virtualization systems. Developed to provide greater flexibility to FileMaker Pro users, GoSign v3.5 allows users to customize the appearance and layout of the signature pad in FileMaker Pro, while also providing cross-platform and cross-device functionality. GoSign began on iOS as an add-on to FileMaker Go and was later adapted for use with FileMaker Pro running on machines with touchscreens. With the latest release, input capability is extended to electronic signature capture pads.